Immaculate rainforests, warm rivers, white-sand beaches, and a Pura Vida (“pure life”) lifestyle that is unmatched throughout the world. 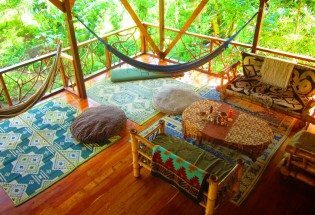 We work with some of the most progressive eco-lodges, remote communities, and authentic Costa Rican attractions. If you are looking for an experience that is more than just bus tours and tourist traps, let Evolve CR show you what Costa Rica is truly all about. Fly to San Jose Costa Rica. Arrive in San Jose.Our private bus will transfer us from the airport to our hotel in San Jose. After dinner at the hotel, we will head to bed following an exhausting day in order to energize ourselves for the week ahead. Today our journey takes us up north to the area of the Arenal Volcano. Some of the most impressive views in all of Costa Rica are found in and around the town of Arenal.Upon arrival, have some free time for lunch in La Fortuna. Start a Zip Line activity. The feeling of flying through the tops of the rainforest Ziplines is something you must experience. The Vista Arenal Canopy tour is adrenaline-filled and includes 12 zip line cables & 14 platforms. Includes: Transport and bilingual guides. What to bring: Long pants or shorts that are at least knee length, closed shoes (hiking boots or tennis shoes), rain gear, sun block, and insect repellent.We will travel to the Baldi Hot Springs Resort and have an opportunity to have dinner, relax and soak up our first full day in Costa Rica. Enjoy breakfast and depart for Jaco. Enjoy a Session of surfing. Surfs up Beach Day! Today is the day you learn how to surf or for those who already know how get better at surfing. Our professional surf instructors will give us a full inland lesson on safety and proper technique so that we can have the best possible session, then we all hit the water together (instructors included). Arrive at our accommodations in Uvita and settle down. Enjoy dinner at the hotel followed by a Salsa lesson. 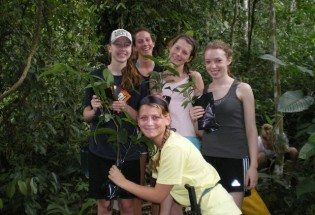 Participate in a Community Service Activity at a local School in Manuel Antonio. Finish activity, enjoy lunch. We will get on board a boat tour of Whale Tail National Park; snorkel, swim and perhaps see dolphins at play- with licensed tour boat operator for Costa Rica. Check in at Hotel in Uvita, enjoy dinner and relax for the rest of the evening. On this day we will visit a local Waterfall. In the afternoon we will get into boats and visit a mangrove forest. The mangrove ecosystem is one of the most important to the world’s economies and one of the most endangered. In addition to providing habitat to raccoons, tropical cats, sloth and a myriad of birds that are easily seen above the water mangrove forests serve two very important ecological functions under water. First their extensive and interlocked roots protect and buffer the shore collecting and stabilizing sand, leaves and other organic matter into muddy soil. Second, they are the nursery for hundreds of fish, crab, shellfish and other marine species as well as crocodiles. In the morning we will participate in a Ranch Tour and Orientation. Following this activity we will break into groups for the remainder of the day. 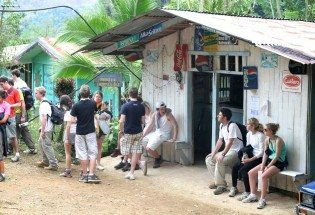 Half the group will participate in our first activities at the ranch which will comprise of learning how to cook Costa Rican meals in a responsible way by using a methane Biogester, rocket stove, cob oven and solar cookers. In so doing, they will be able to help prepare lunch at the Ranch. The other half of the group, will participate in a Natural Building workshop, designing and building structures to minimize the impact on our environment and maximize their sustainability. Using the stones and rocks, Straw/Natural Grasses, Bambo and even Manure, students will learn techniques such as Cob Building, that utilizes clay, sand and straw or other fibers; Wattle and Daub, which uses woven woods or bamboo to construct a structure at the Ranch that avoids using concrete which is widely used across Costa Rica. In the late afternoon we have a chance to swim in the on-site Waterfall. In the evening we will gather for dinner followed by an evening activity at the Ranch (journaling, games, discussion). On this morning we will participate in a hike through the primary and secondary forests, for Mountain views and to see the wildlife. 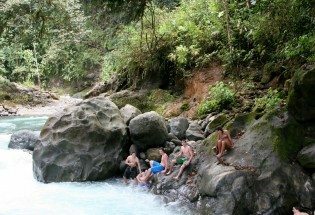 We will have a chance to hop into one of the many rainforest rivers for a quick swim in one of the pristine waterfalls or swimming holes. In the afternoon. we will organize a summer camp activity for local kids on the field. 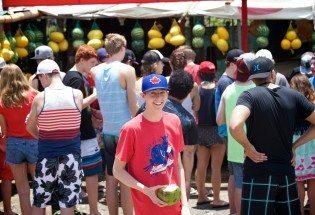 Pack up and say goodbye to Costa Rica and board our group flight home. Three meals a day included in trip. Meals at locally owned and run restaurants serving authentic cuisine sufficient for teenage appetites. Costa Rica is ranked #1 in the Happy Planet Index. We will transfer to our sustainable eco-lodge where we will be living & working for multiple days. White water raft down the Savegre River! Enjoy the beauty of the Costa Rican coastline.